All-electric vehicles (EV) come in many different size classes, but the largest share of EV sales in calendar year 2016 were large cars (35%) and standard sport utility vehicles (SUV)(23%). Plug-in hybrid electric vehicle (PHEV) sales were mainly compact and midsize cars, with 42% and 40% of the market share, respectively. 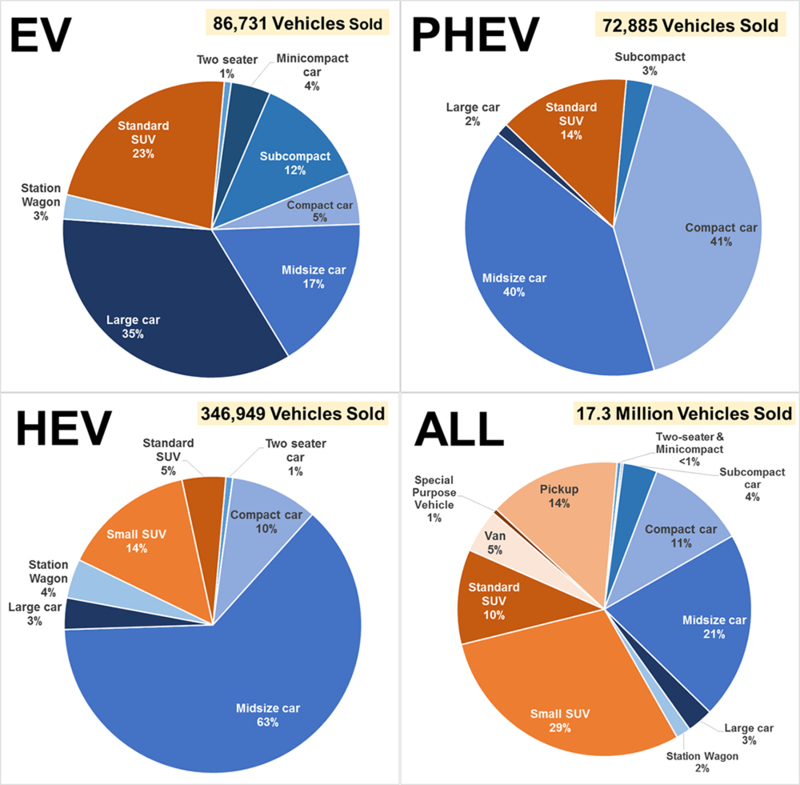 Of the nearly 347,000 hybrid electric vehicles (HEV) sold in 2016, close to three-quarters were midsize cars. There were 17.3 million light vehicles sold in the United States in 2016, more than half were SUVs, pickups, and vans. El Dorado County Air Quality Management District is seeking proposals, from businesses to receive grant funding to install chargers at their businesses for public use. Celebrate Memorial Day and electric vehicles at the Lake Tahoe Summer Kick-off Car Show. This event is free to attend and free to enter electric vehicles of any make and model. 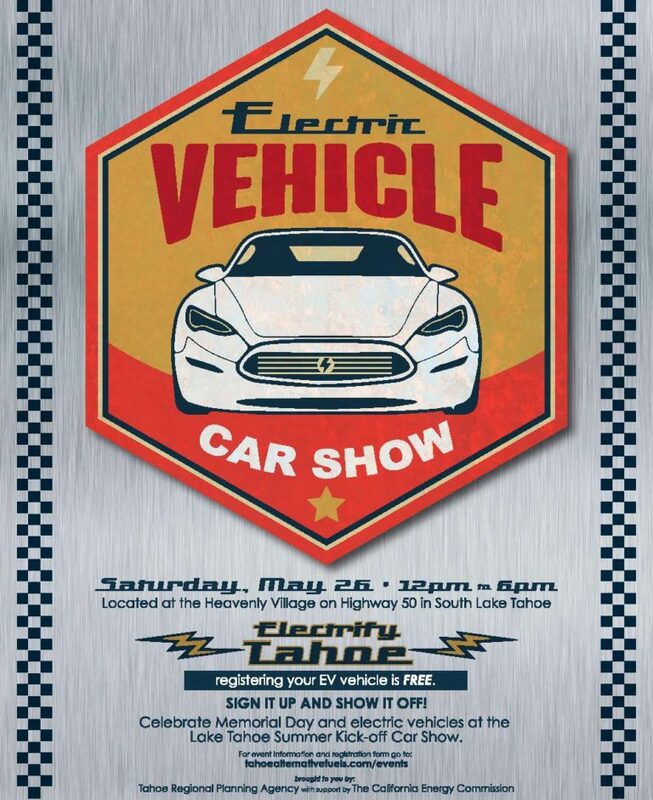 Located at the Heavenly Village on Highway 50 in South Lake Tahoe from 12 – 6pm, this new addition to a classic car show is your chance to see the latest technology, show off your electric vehicle street cred, or even shine up and show off your trusty EV that keeps on going. Download the registration form and bring the completed form to Lake Tahoe to the check-in booth in the Heavenly Village (corner of Heavenly Village Way and Highway 50) by 10am on Saturday, May 26th. 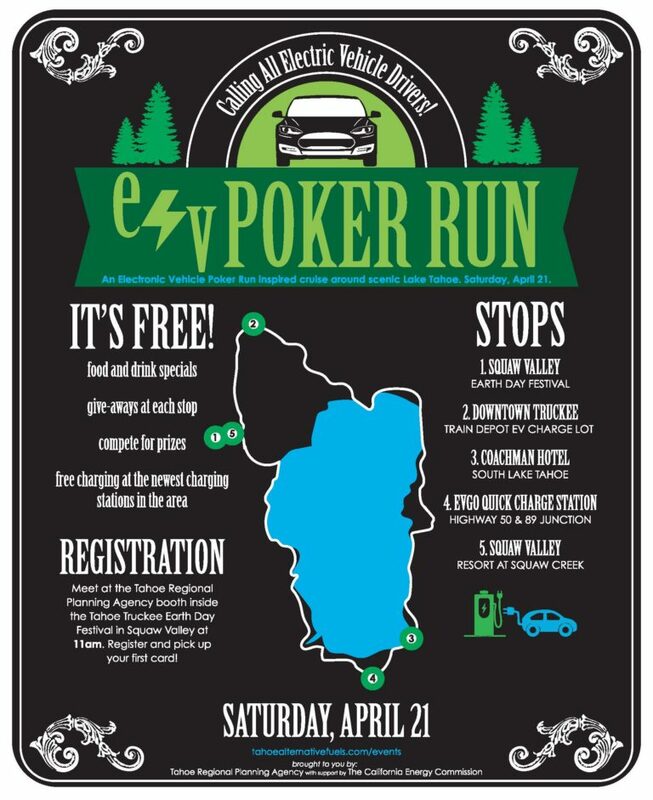 Electric vehicle drivers can celebrate Earth Day while taking a poker run inspired scenic cruise around Lake Tahoe on Saturday, April 21. TahoeAlternativeFuels.com is hosting the free activity from 11 a.m. – 5 p.m. as part of its ongoing efforts to raise awareness of the ease and accessibility of driving plug-in electric vehicles in the Tahoe-Truckee Region. Drivers of any electric vehicle are invited to participate in the poker run, enjoy food and drink specials, free charging, and compete for prizes in best hand, worst hand and best mileage/efficiency categories. Registration and the first card of the poker run will take place at the Tahoe Truckee Earth Day Celebration at the Village at Squaw Valley, in the Tahoe Regional Planning Agency booth at 11 a.m. Then it’s off to downtown Truckee for the second stop in the poker run at the train depot’s charging lot. Hosted by the Town of Truckee and Tahoe Donner Public Utility District, this stop offers free charging, give-aways, and plenty of nearby points of interest to peruse. Poker Run participants can enjoy a 15% Earth Day Lodging Rate during Earth Day weekend! This discount is available by making a reservation with Squaw Lodging by phone only. Call (866) 818-6963 and ask for the special Earth Day Lodging Rate. Celebrate and promote the region’s unique beauty! The Tahoe Truckee Earth Day Festival is a volunteer run, non-profit event to recognize, celebrate and promote the region’s unique beauty. Come to the Village at Squaw Valley on April 22, 2017 from 11am to 5pm for fun, live music and entertainment, and to learn how to preserve and protect our local and global natural resources. 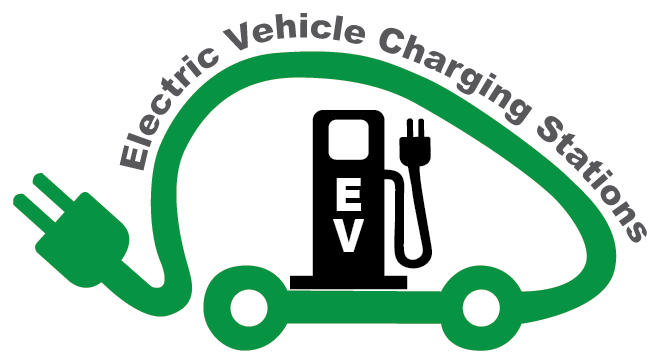 Liberty Utilities will host its first-ever Electric Vehicle (EV) Summit featuring presentations by key stakeholders and displays of Tesla vehicles, a Proterra 40-foot electric bus, and a ChargePoint EV charging station. Co-sponsors of the event include the Tahoe Regional Planning Agency (TRPA), ProTerra and ChargePoint. The public is invited to attend, but pre-registration is required as seating is limited. Anyone who has not pre-registered will not be able to attend the presentations. To register, contact Kathy.carter2@libertyutilities.com by April 19th.